Hey, this is Rick Kaselj from ExercisesForInjuries.com. I wanted to go through a concept of self traction when it relates to your back. What traction is, is to put a light stretch on the low back in order to decrease the pressure that’s built up in your discs in your lower back. So what happens is when you go to bed and you lie on your back, sleep gives your body a chance to recover and what happens with your back is it ends up expanding, and the discs end up expanding, end up being larger in height compared to the end of the day. Now, when you get up and start doing things and moving around the discs end up compressing and getting smaller. And this is especially true if you end up doing activities that involve higher stress on the back. 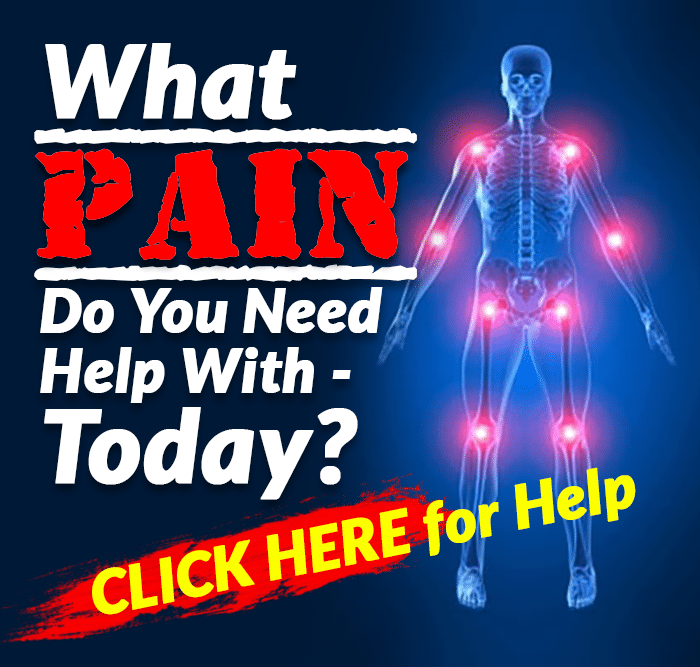 For example if you end up doing a lot of sitting or a lot of driving, that sitting and driving puts about 40% more pressure on your back and more pressure on the discs. As these discs get smaller and smaller throughout the day, what we can end up doing is decreasing the pressure in the back by elongating those discs, and you can do that by something that I call Self Traction. How to do Self Traction? 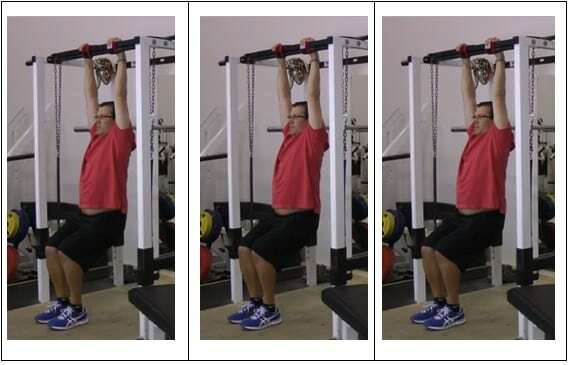 If I am in a gym setting, I can end up using a chin up bar or a squat rack and what I want to do is I want to end up grabbing the bar above me. My hands are underneath my shoulders. I am letting myself hang and the big thing I am focusing on is I am letting my hips drop. Dropping the hips and looking at getting traction through my back. I am going to do that for about 15 seconds and if this is your first time doing this, you will end up going light, because it ends up benefiting 95% of people but 5% of people it doesn’t work for and we want to start off gentle as opposed to going aggressively and irritating things. 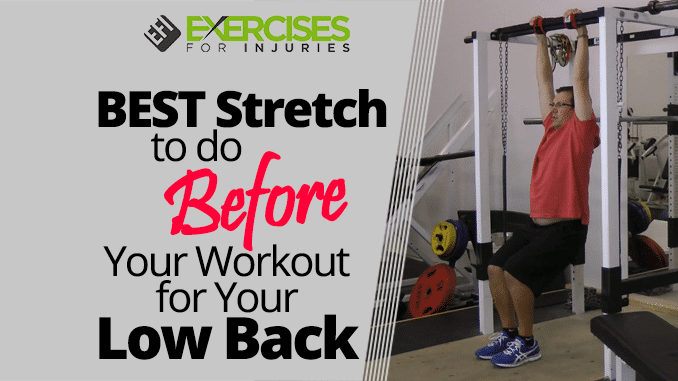 If you end up being really tight in the shoulders and in the mid back tightness, it might take a bit of tweaking when it comes to the technique in order to hit that low back area. I will end up doing another repetition, hands directly underneath my shoulders. I am really focusing in on dropping those hips and letting those hips drop. And then I want to do a self test to see how my back feels. Does that make my back feel better? Is there no change or it ends up making it worse? If it makes it worse, go back and make sure that you are doing the technique right. See if you have gone too aggressively; make sure you have done the technique right. If there is no difference, it’s not better or worse, you can go back and check to see if you have done the technique correctly. If you end up feeling better, like it ends up making my back feel better I want to build on good, I want to build on my back feeling better. I would end up doing another repetition, and then as I end up doing more repetitions, I get more comfortable and I can isolate more in that back area because a lot of times the first rep might focus more on the shoulder, second rep might be a little bit more mid back, and finally in the third repetition I can target and hit the low back a lot better and for me that ends up feeling better. My back feels looser, my back feels happier. Give that a go if you end up having a stiff and achy back. If you end up doing a lot of driving or you end up doing a lot of sitting, try the Self Traction. 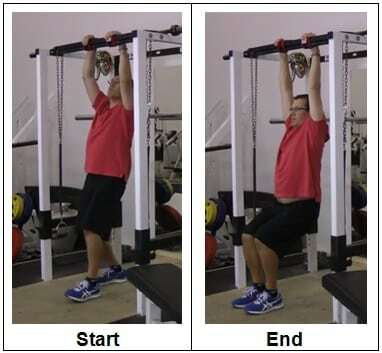 Especially if you work in a gym setting you can use a squat rack or a pull up bar and just hang from the pull up bar or the squat rack and stretch out your lower back. So this is Rick Kaselj from ExercisesForInjuries.com. 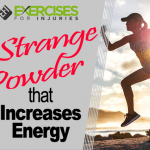 Make sure to swing by ExercisesForInjuries.com. Enter in your injury or pain. There is a good chance that I have a video, interview or blog post that will end up helping you out. Secondly if you are watching this on YouTube, head up above and hit Subscribe and what that will do is that every couple of days you will end up getting a video from myself where I talk about injury and pain or you will end up getting a guest video from my friends in the fitness world, or lastly you will end up getting an interview that I have done with one of my friends.